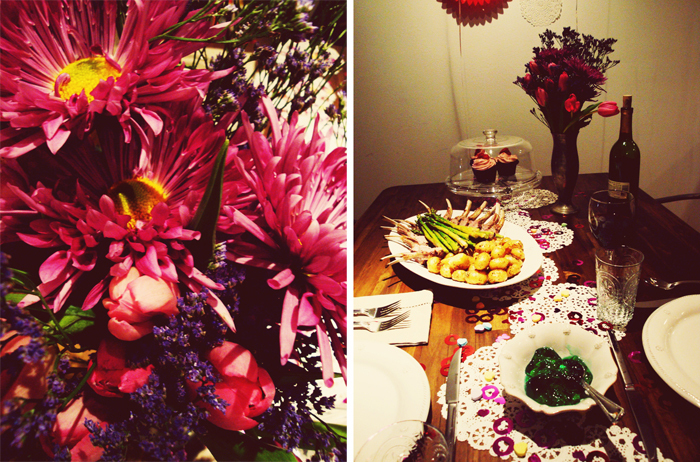 Just wanted to share some snapshots from our little Valentine's Day party for 2 last night. We rarely do anything out of the ordinary for V-day, but this year John decided to cook what was one of the best meals of 2012 - a roast rack of lamb with asparagus and rosemary garlic potatoes. This is a guy that has frozen pizza, cereal and pancakes on his cooking repertoire. Consider myself blown away that not only did he attempt such an ambitious meal, but that he TOTALLY PULLED IT OFF! Amazed. I am beyond lucky to be his Mrs...love that guy so much. Wanting to make the evening a little more special, I went to the party store and picked up some balloons, heart garlands, candy hearts and confetti. John was so surprised when he walked into the decked out apartment, and his face was priceless. I tried to snap a photo of him walking in, but of course that turned out blurry. Such is my luck. This is AMAZING!! !how cute are you guys!!HVD!!! Oh this is so cute!!! You went all out, love it! wow..totally impressed with the bro...unbelievable, really! gorgeous all around! what a guy!! the lamb looks amazing. i love your place, btw. I love the photos, what are they taken with?! Just a regular Sony Cybershot point-and-shoot camera....but I so badly want to get a DSLR camera! You guys are so cute! I really love the place, lady!